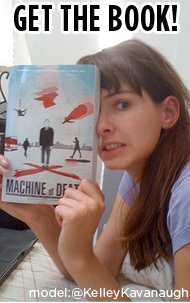 Machine of Death » All stories have now been read. Updates 09 Jul 2007 12:01 am by David ! All stories have now been read. The final lineup for the book is being determined, and we are contacting the authors of our favorite stories. Once we have received affirmative responses from everyone, we will post the list. 1. We have tried to contact you, and either your email address didn’t work, or the message went into your spam folder, or there was some other communication problem. If you still haven’t heard by July 15th, please write us at info at machineofdeath dot net. 2. We haven’t yet sent your notification. For various reasons, including the massive flood of stories we received in the last few days of the submissions period, we haven’t gotten around to notifying everybody yet. As above, if you haven’t heard by July 15th, write us at info at machineofdeath dot net. Additionally, it should be emphasized that we truly received many excellent stories, and deciding which are best-suited for one short book is necessarily a subjective task. If you weren’t chosen, you’re in good company — over 650 other stories weren’t selected, either. After July 15th, feel free to write us if you would like more specific feedback about your story. Although we can’t promise we’ll be quick about it, we do promise to respond to everyone that asks. Thanks for your interest, and your patience! Feel free to hang out on the forum in the meantime. Comments Off on All stories have now been read.